great port with the fertile pampas. 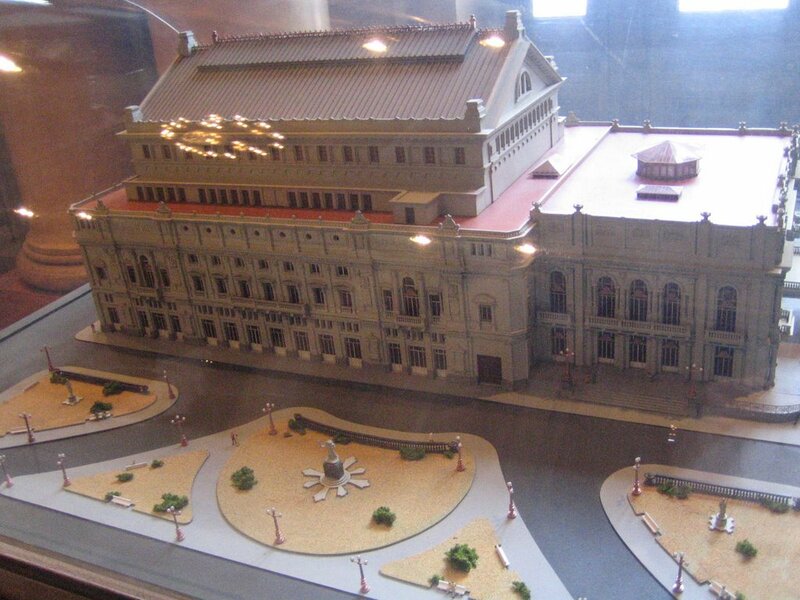 As construction dragged on, one of the Italian architects died and the other was assassinated. 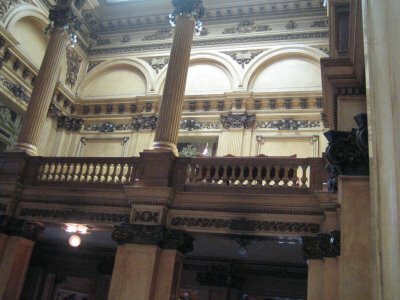 The theater is reputed to have perfect acoustics but we couldn’t tell when we were ushered into the dark hall that seats about 2,500 in three rows of boxes plus four general seating tiers with standing room for an additional 500 people..
call this hodge-podge: eclectic. 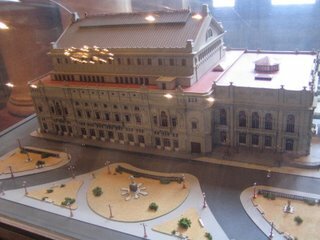 Electism appears to particulary affect opera venues as I was reminded each morning at my Paris subway stop – the Opera Garnier. Inside, photos were verboten except for the entrance hall with its Veronese marble. 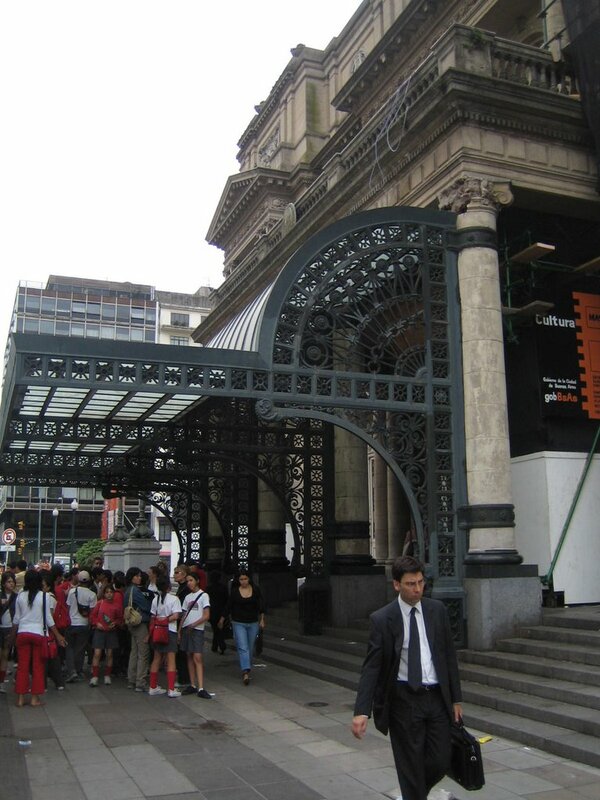 Near the entrance is “El Salón de los Bustos” (Where are we now? We’re in the Hall of the Busts. In Houston, we are thinking about renaming the Enron building with that title). Here’s two famous bustos. I can identify the one on the right, but who’s that on the left? 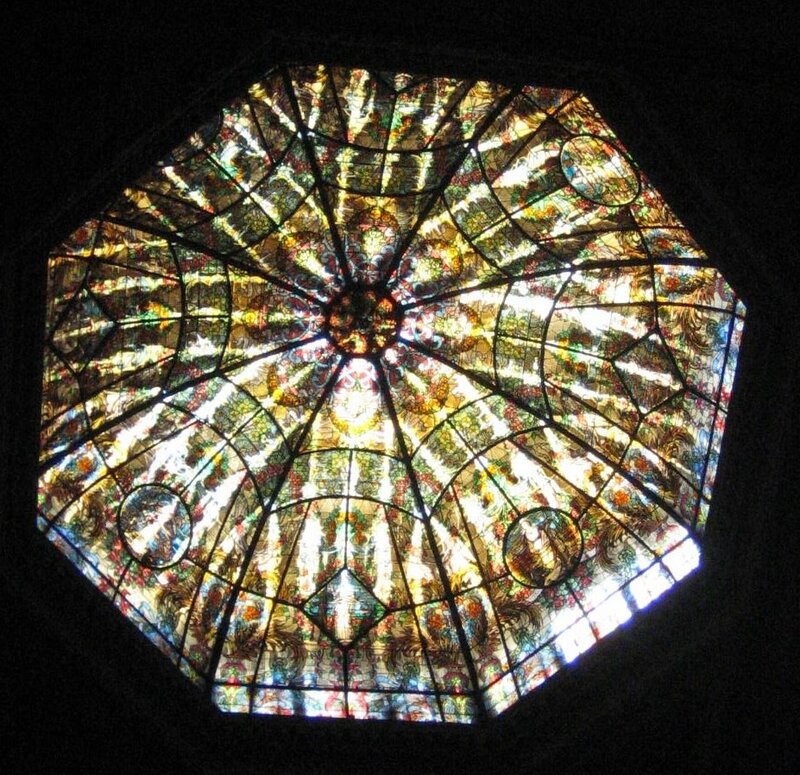 The entrance hall contains marble from Italy (Carrara), Belgium, and Portugal and includes this stain glass canopy to which the shaky photographer fails to do justice. 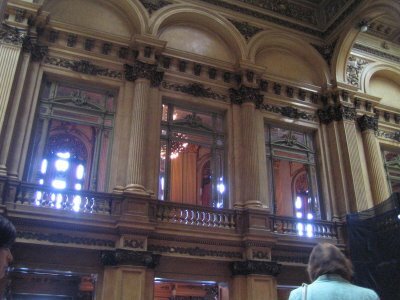 At the end of our tour, we were ushered into the Salón Dorado on the same level to enjoy a very short violin recital in this French decorated hall patterned a little on Versailles. 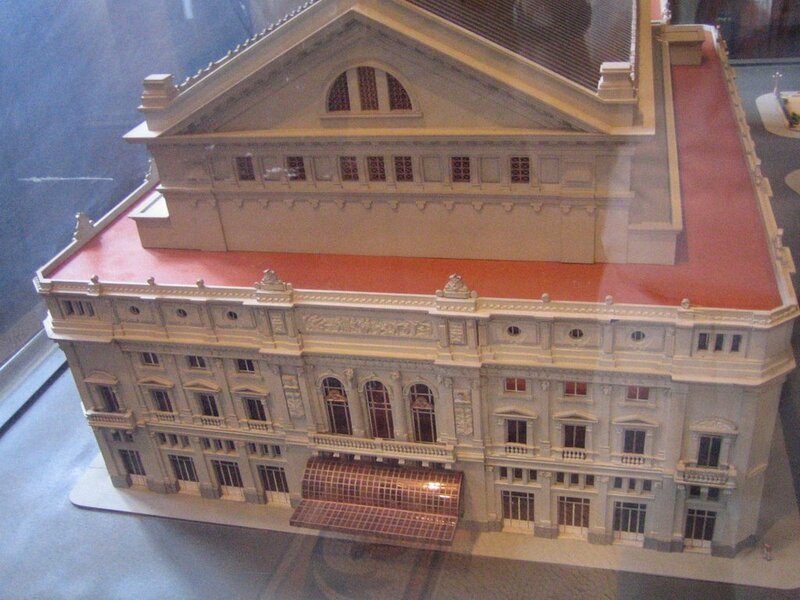 A 1970s expansion created a virtual opera factory by tunneling under nearby streets. 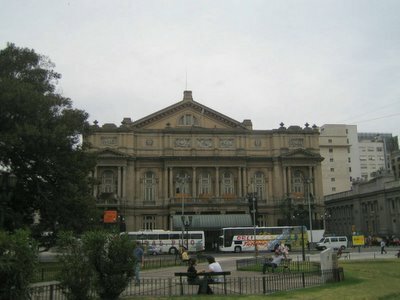 Below Colon Teatro we saw a beehive of performing art support activities including ballet practice in a circular mirrored hall, the painting of huge scenery backdrops, costume sewing, vocal rehearsals -- as well as storage rooms for shoes, wigs, and costumes from just about every opera staged here. 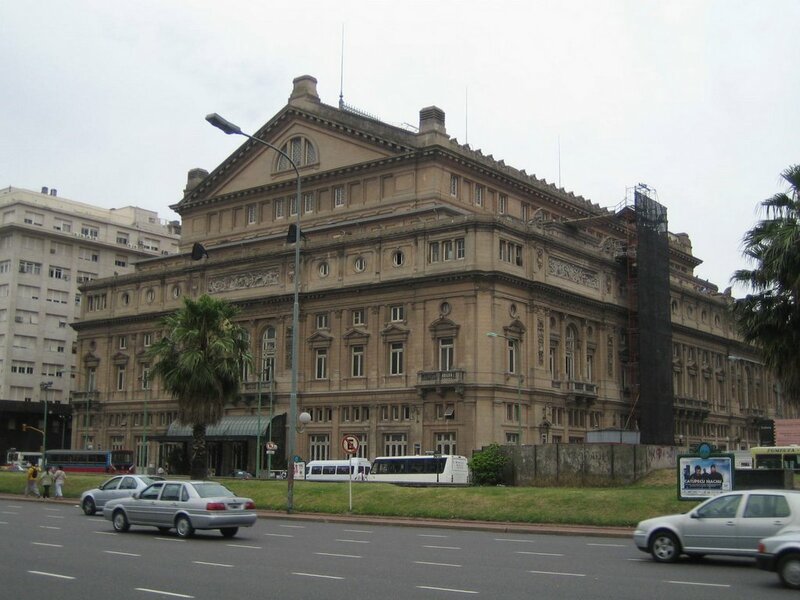 The theatre also contains a library (with every opera program since it opened in 1908), an experimental center to encourage modern performing arts in Argentina (Centro de Experimentación del Teatro Colón), and (you guessed it!) a small but jammed gift shop. The theatre also supports several standing orchestras and ballet companies, including some limited to those under 25 years of age. Pretty much all of the big names in music have appeared here (and continue to do so) since the place opened nearly 100 years ago. 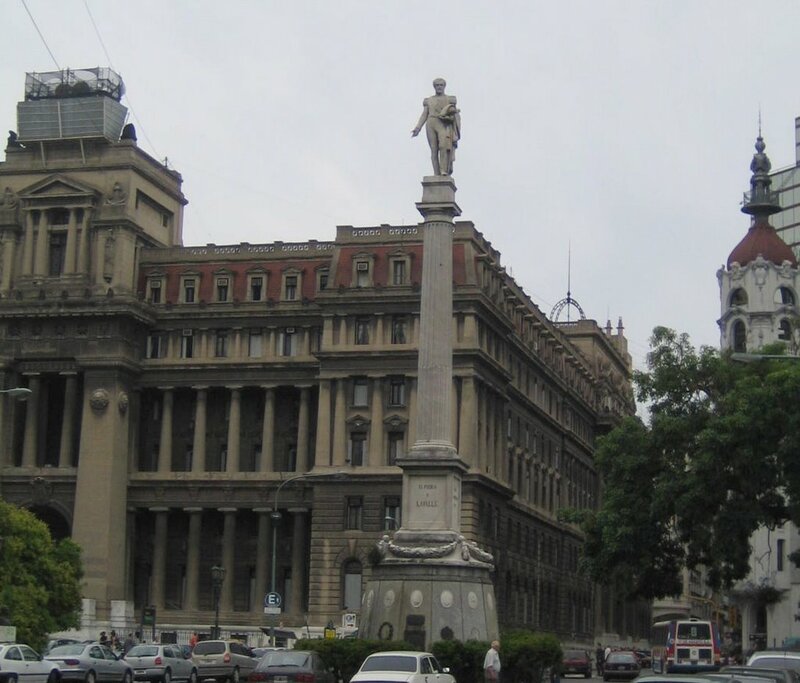 Park Lavalle contains a military statue (why are we not surprised). This one has fourteen sides, one for each Argentine state when it was constructed. 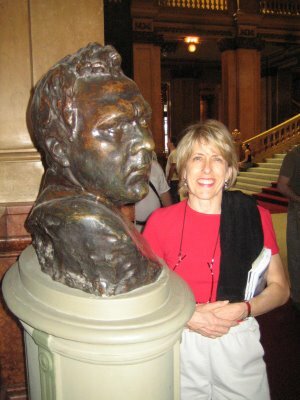 It honors general and governor Juan Lavalle, best known for opposing (and losing to) an early Argentine dictator. A street from the edge of the two block long Plaza Lavalle, leads to the obelisk at Plaza de la República. 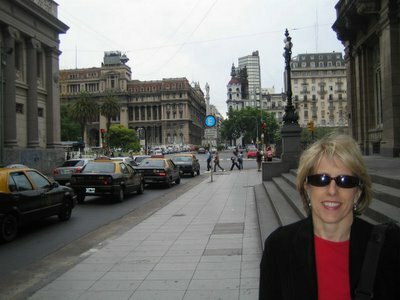 We walked down this street to get to the Obelisk, crossing what the Argentines consider to be the widest avenue in the world: 9 de Julio Avenue (Avenue 9 July), named after the Argentine independence day in 1816). Much of turn-of-that-century Buenos Aires looks like Paris, mimicking the five story limestone buildings that populate much of the European capital’s close-in neighborhoods. However, Avenue 9 July is way too wide to be Parisian – About 460 feet with 14 traffic lanes in what is really 4 separate roads divided by medians. 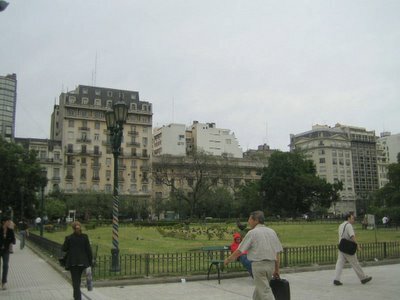 BA is laid out in a grid and the Porteños devoted a whole block to the avenue making it a city block wide. 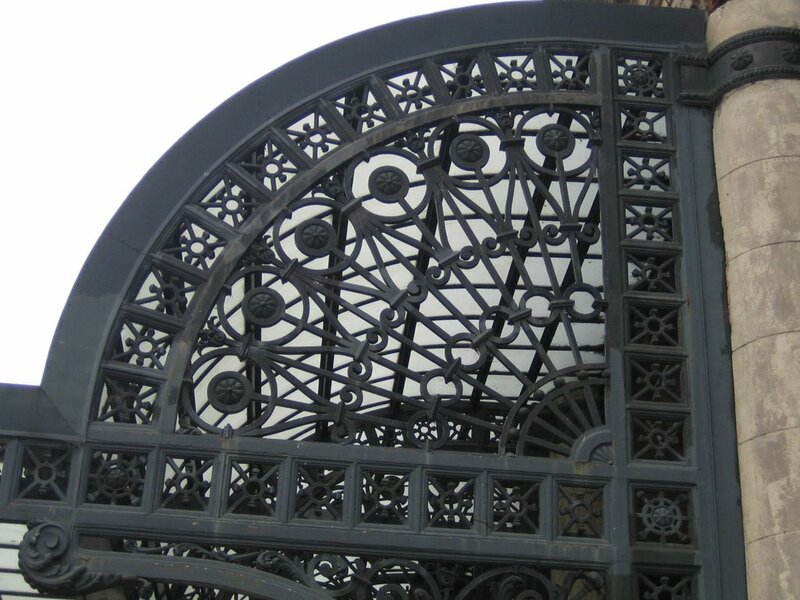 Planned in 1888, construction on the avenue started in 1937 and completed in the 1960s, demonstrating that Houston contractors are not the slowest when it come to finishing a road. 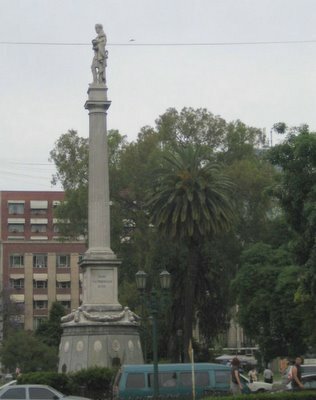 Our last picture shows Buenos Aires’ Obelisk which sits smack dab in the center of Plaza de la República on 9 de Julio Avenue. The Plaza marks the site of the first unfurling of the Argentine flag (pop quiz: remember General Manuel Belgrano on the Luján page?) The obelisk was erected (what other verb can we use) to commemorate the 400th anniversary of the founding of the city. In fact, the city founded in 1536 had to be abandoned 5 years later due to a pesky Indian problem. 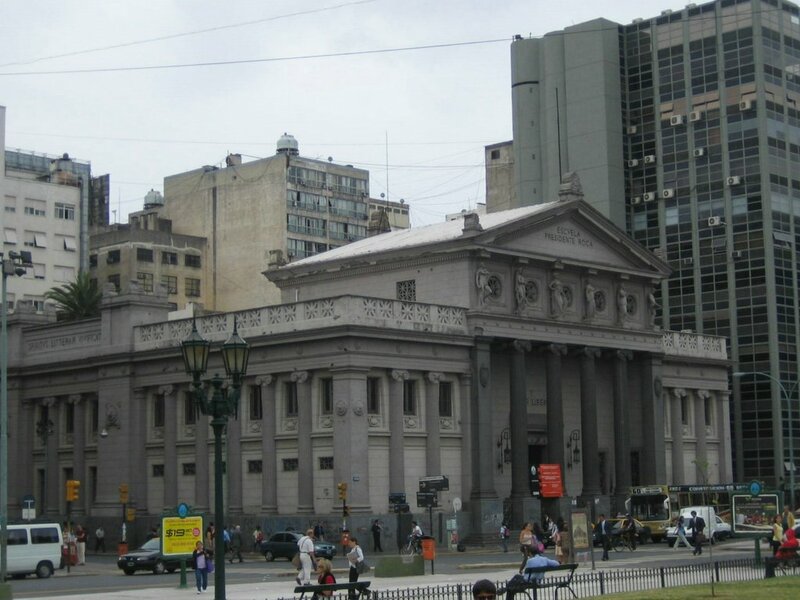 Fortunately for the Spanish but not for the indigenous peoples, the 1580 re-founding of BA took hold. 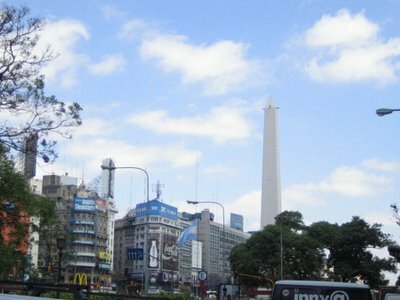 The 201 foot tall obelisk was built in 4 weeks in 1936 (obviously not by the people who built the 9 de Julio Avenue). Our Obelisk in Washington, D.C. is over twice as tall but took 36 years to complete. We Texans, of course, did much better, building our art deco San Jacinto Obelisk near Houston in only 3 years. We don’t need to tell you that it is taller than its little brothers inside-the-beltway or in BA. By coincidence, San Jacinto’s construction started the same year as the Obelisco de Buenos Aires. (And all this 62 years before Viagra hit the market). Is that an obelisk in your pocket or are you just glad to see me? 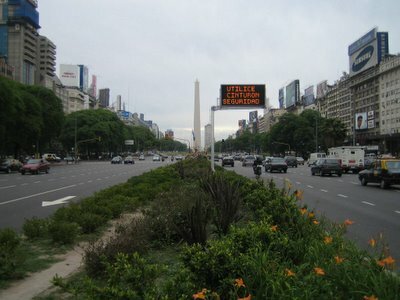 As a symbol of Buenos Aires, the obelisk gets a lot of iconic augmentation such as signs and coverings. In fact, we missed one by only 2 days – the celebration of 2005 World AIDS Day. 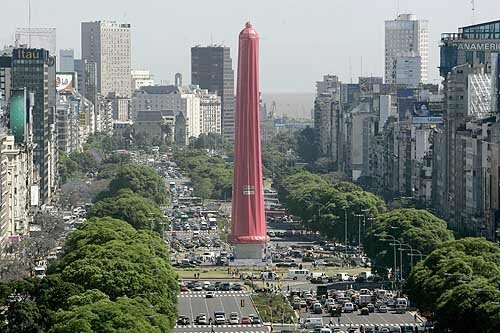 On December 1 BA draped its obelisk in (you guessed it) a large pink condom. Internet Explorer users, want to see more? Then download the free Firefox browser by clicking here – these pages display better in Foxfire and its more secure than that Microsoft thing.